While looking for something else I stumbled across an interesting opinion article on motorcycle-usa.com about how the AMA was failing at promoting motorcycle racing in the US, despite being controlled by NASCAR. 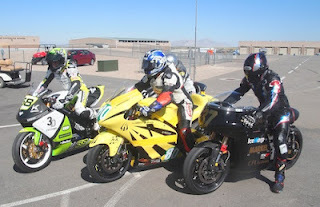 The thrust of the article was that given the success of NASCAR, those people ought to be able to reawaken the US to motorcycle racing, so that fans would flock to the AMA which is the premier motorcycle racing series in the US. But, what does this have to do with electric motorcycle racing? It illustrates to us the opinion of one motorcycle racer as to the role and purpose of the racing promotion organization. The interesting thing is the author of that piece, and the timing of when it was published. The name Steve Atlas is familiar to us because he'd ridden with Brammo during the 2011 and 2012 TTXGP seasons. The date on the article? 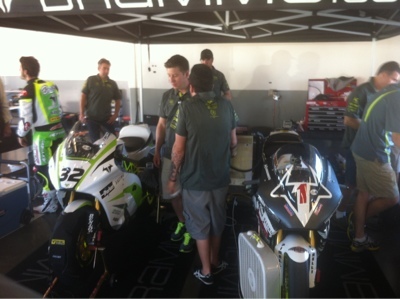 May 3, 2011, or just prior to his first outing with Brammo at the 2011 TTXGP at Infineon Raceway. So, what did SteveO have to say about the AMA on the eve of his career in electric motorcycle racing? "With the series’ schedule shrinking year by year and fan attendance dwindling at every round, is there a future?" "With a significant piece of its current business model based on making money by charging riders and teams as much as humanly possible for credentials, it will be difficult to continue with the perpetually shrinking grids we are seeing these days." "Secondly, when was the last time you rolled into a city hosting an upcoming AMA race and heard a single radio plug, saw a billboard or watched a TV commercial promoting the event? And they wonder why no one comes out to the races; they don’t even know they exist." In other words, it's the role of the race promoter organization to, um, actually promote the race. The lack of awareness about the series rests solely in the lap of the race promoter, who is responsible for getting media attention on the series. This is especially demonstrated when SteveO closes with this: "They need to figure out how to get people to come to the track and seriously boost the TV viewing audience. This hinges 100% around their ability to promote the sport." These guys riding the bikes in the races - they, and the rest of their teams, need to earn a paycheck, just like the rest of us. In racing that paycheck ultimately derives from fans, who buy tickets, and whose eyeballs the advertisers are trying to reach. Everything he wrote was aimed at DMG, the race promoter for AMA at the time. But, what he wrote could also be said of the electric motorcycle racing promotion organizations, TTXGP, FIM e-Power and eRoadRacing. It was TTXGP's job to promote the race series, just as it's eRoadRacing's job today to do so. FIM is the sanctioning and rules organization, eRoadRacing is the promoter. How much of the typical promotion has TTXGP or eRoadRacing done? There's a TV deal with SpeedTV, but what else? Essentially nobody knows about electric motorcycle racing, and the sport is suffering for it. Well, the first part isn't entirely true. Sometime in 2012 there were some AT&T line workers in the neighborhood working on the wires, and they spotted my car and we got to talking about restoring cars and electric vehicles. Turns out they'd seen something on SpeedTV about electric motorcycle racing, so clearly that deal has resulted in SOME awareness. But whatever that was hasn't been enough to cause a flock of fans to get rabidly excited about the sport. Maybe it's just that the technology (still) isn't mature enough, despite the huge leaps and bounds of improvements that have been made. The speeds and race length aren't on par with AMA's racing. Yes, the speed of the top bikes are close to AMA 600cc superbikes, but the race length is only half AMA's. At the speed bracket of the top electric bikes, it's close enough to the gassers to be good enough to make exciting racing, but only if there were a large enough grid of top electric bikes. Which gets back to the question of funding. It costs big bucks to field a top electric bike team, so where is the money going to come from? While the teams are responsible for finding their sponsors, it's the responsibility, as SteveO said, to make the whole sport so compelling that sponsors organically show up looking for teams to sponsor.